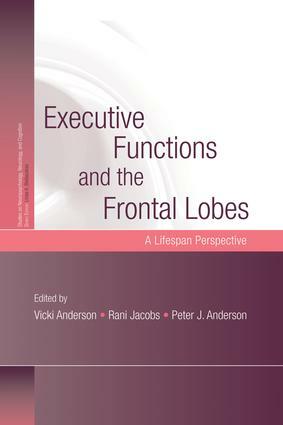 This volume has as its primary aim the examination of issues concerning executive function and frontal lobe development. While many texts have addressed these issues, this is the first to do so within a specifically developmental framework. This area of cognitive function has received increasing attention over the past decade, and it is now established that the frontal lobes, and associated executive functions, are critical for efficient functioning in daily life. It is also clear, and of particular relevance to this text, that these functions develop gradually through childhood, and then deteriorate during old age. These developmental trajectories, and the impact of any interruption to them, are the focus of this volume. Part 1. A Developmental-Theoretical Framework for Executive Function. P.J. Anderson, Towards a Developmental Model of Executive Function. C.R. De Luca, R.L. Leventer, Developmental Trajectories of Executive Function across the Lifespan. L.H. Phillips, J.D. Henry, Adult Aging and Executive Function. B. Kolb, M. Monfils, N. Sherren, Recovery from Frontal Cortical Injury during Development. Part 2. Assessment of Executive Function Across the Lifespan. K. Espy et al., Methodological and Conceptual Issues in Understanding the Development of Executive Control in the Preschool Period. V. Anderson, P.J. Anderson, R. Jacobs, Development and Assessment of Executive Function: From Preschool to Adolescence. T. Wardill, V. Anderson, The Assessment of Executive Functioning in Older Adults. G.A. Gioia, P.K. Isquith, L.E. Kenealy, Assessment of Behavioral Aspects of Executive Function. A.G. Wood, E. Smith, Pediatric Neuroimaging Studies: A Window to Cognitive Development of the Frontal Lobes. Part 3. Impairments of Executive Function Across the Lifespan. K. Howard, P.J. Anderson, H.G. Taylor, Executive Functioning and Attention in Children Born Preterm. K.O. Yeates, V. Anderson, Childhood Traumatic Brain Injury, Executive Functions, and Social Outcomes: Towards an Integrative Model for Research and Clinical Practice. V. Anderson et al., Executive Functions after Frontal Lobe Insult in Childhood. P.J. Eslinger, K.R. Biddle, Prefrontal Cortex and the Maturation of Executive Functions, Cognitive Expertise, and Social Adaptation. V. Anderson, Attention Deficits and the Frontal Lobes. J. Snowden, Frontotemporal Dementia: Correlations between Pathology and Function. M.M. Saling, J. Bradshaw, From A-synucleopathy to Executive Dysfunction: Early-stage Parkinson’s Disease. Part 4. Rehabilitation of Impairments in Executive Function. B.A. Wilson, J. Evans, Models for the Rehabilitation of Executive Impairments. M. Ylivasaker, T. Feeney, Helping Children without Making Them Helpless: Facilitating Development of Executive Self-regulation in Children and Adolescents. C. Catroppa, V. Anderson, Intervention Approaches for Executive Dysfunction following Brain Injury in Childhood. S. McDonald, Social Information Processing Difficulties in Adults and Implications for Treatment.